Open Source, mental health promoting, big data gathering, progressive web app, hosted in the cloud. I was walking around campus and was noticing how many people were smiling and who weren't. 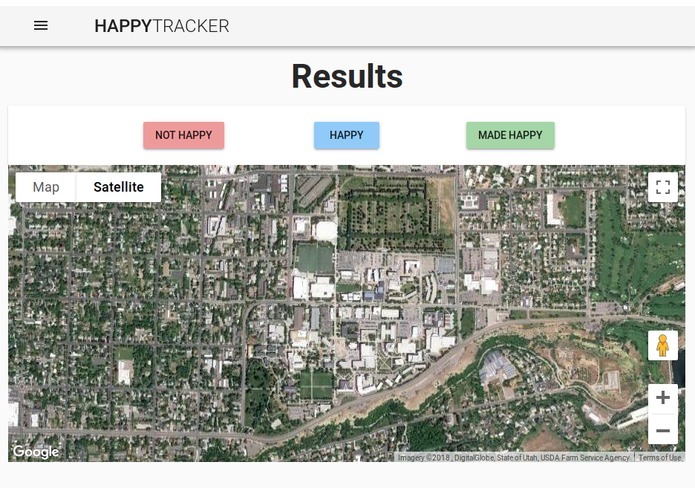 I thought I would like to see where on campus people were most happy so I thought up what is now our app. You swipe left for someone who is not smiling, right for someone who is smiling, and up if you make someone smile. The app tracks where you are and sends it to a server. You can then view all the points on a map. Skyler and I built it using Vue.js, a front end web framework, and Netlify, a cloud hosting service. We also used mongodb, mongoose, Vuetify, and Axios. There were lots of pain points getting the server to get the build process correct so that it would bind the dependencies. There was also a bit of trouble getting the maps to show correctly. We made a great plan and pretty much stuck with it. Skyler and I both stayed up all night getting this done and we both learned brand new technologies that were critical to the project working.